Déjà Vu at the 2018 Shangri-La Dialogue? Last year, CIMSEC published an article analyzing Beijing’s decision to send an unusually low-ranking delegation head, Lieutenant General (LTG) He Lei who serves as the Vice President of the People’s Liberation Army’s (PLA) Academy of Military Science (AMS), to the 2017 Shangri-La Dialogue (SLD). The selection was a sharp departure from general past practice. In 2011, Beijing dispatched its Defense Minister (the highest-ranked representative to date) followed by the Vice President of the PLA AMS (lowest-ranked representative so far) the following year. From 2013 to 2016, the Chinese delegation was led by a deputy chief-level PLA general officer, closer in rank to the other attending defense ministers. This year, Beijing chose once again to send LTG He to the premier security forum in the Indo-Pacific region, despite last year’s pledge to send a delegation led by a four-star officer of Central Military Committee rank. It was speculated that Beijing’s decision was a subtle refutation of last year’s stated agenda of “upholding the rules-based regional order, practical measures to avoid conflict at sea, and nuclear dangers in the Asia-Pacific” and pointed to a deeper problem that China has with the annual dialogue itself. 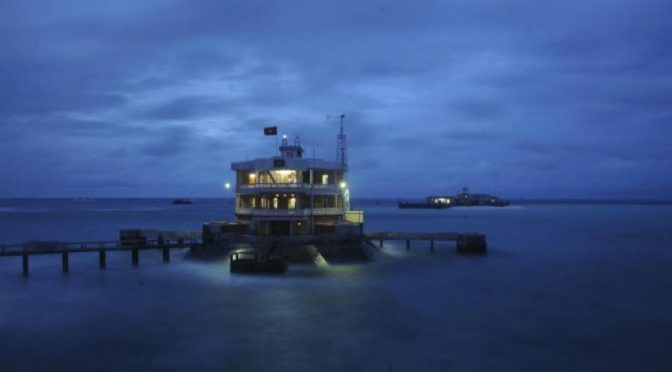 Beijing chooses not to discuss its maritime disputes in any multilateral forum, asserting that bilateral negotiations are the appropriate mechanism to deliberate such contentious issues. The South China Sea (SCS) is a recurrent SLD topic – and China, much to its chagrin, has little influence over the non-friendly and as the Chinese might suggest, hostile agenda. There’s a growing sense within Beijing’s political elites that the SLD has become nothing more than an international forum to highlight (and shame) China’s perceived rule-breaking behavior in the region. It was also suggested that Beijing may have been short-sighted. By downgrading its presence at the SLD, China ceded the strategic narrative and initiative to the United States and its allies. China yielded another highly visible international platform where its competitors could stake out their strategic positions, counter Chinese strategic messaging, and further challenge and encourage Beijing to become a more responsible global stakeholder that contributes positively to the international system. The following analysis compares and contrasts the 2017 and 2018 dialogues in terms of Chinese themes, narratives, responses, and outcomes while trying to answer questions such as why did Beijing again send LTG He, what message is Beijing trying to convey, and what does it portend for the region in the near future? Australian Prime Minister Malcolm Turnbull delivered the keynote speech, averring that Asia’s future peace and prosperity depend on preserving the rules-based regional order that has worked so well for so long. He suggested that China can only expand its strategic influence to match its economic might within the bounds set by the same rules-based regional order. The message implied that Beijing was undermining the rules-based order in Asia and warned that a coercive China would drive its regional neighbors to bolster alliances and partnerships between themselves and the United States. Prime Minister Turnbull also exhorted his regional neighbors to assume greater responsibility for their own security and prosperity. During the first plenary session (United States and Asia-Pacific Security), U.S. Secretary of Defense James Mattis called out China for disregarding other nations’ interests and international law, militarizing the SCS, and undermining regional stability. He reiterated that the United States would continue “to fly, sail and operate wherever international law allows, and demonstrate resolve through operational presence in the SCS and beyond.” Secretary Mattis urged China to recognize that North Korea has become a strategic liability and cautioned Beijing that seeking cooperation on Pyongyang did not mean Washington would not challenge Chinese activities in the SCS. Secretary Mattis also restated America’s steadfast commitment to the defense of Taiwan as outlined in the Taiwan Relations Act. During the second plenary session (Upholding the Rules-based Regional Order), then-Japanese Minister of Defense Tomomi Inada leveled similar criticism against China in her speech. She implied that Beijing bore most of the responsibility for the extant regional instability and criticized China for “unilaterally” altering the status quo in the East China Sea and SCS. Minister Inada also urged Beijing to follow international law and respect the prior year’s tribunal ruling on the SCS and expressed support for U.S. freedom of navigation operations (FONOPs) in the SCS. During the second special session (New Patterns for Security Cooperation), LTG He presented a self-serving speech underscoring the need for a new Asia-Pacific security framework featuring “common, comprehensive, cooperative, and sustainable security.” LTG He emphasized China’s peaceful and benevolent rise that contributes to global peace and prosperity and promoted the ambitious Belt and Road Initiative (BRI) while promising to advance within the Association of Southeast Asian Nations the adoption of a Code of Conduct framework for the SCS. Indian Prime Minister Narendra Modi delivered the keynote speech. 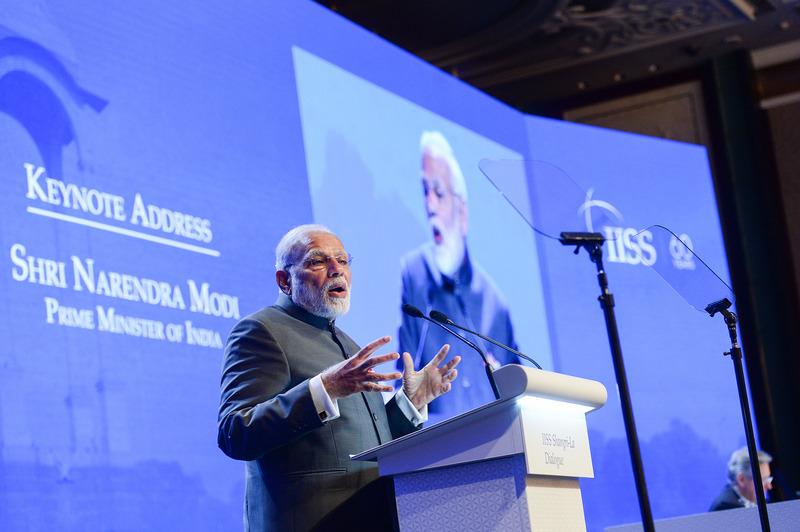 Although the tone of his speech was largely conciliatory and deferential to Beijing, Prime Minister Modi repeatedly used the term “Indo-Pacific,” highlighting the critical role that America plays in the regional (and global) order, and underscored the imperative for a common rules-based system based on the consent of all. During the first plenary session (U.S. 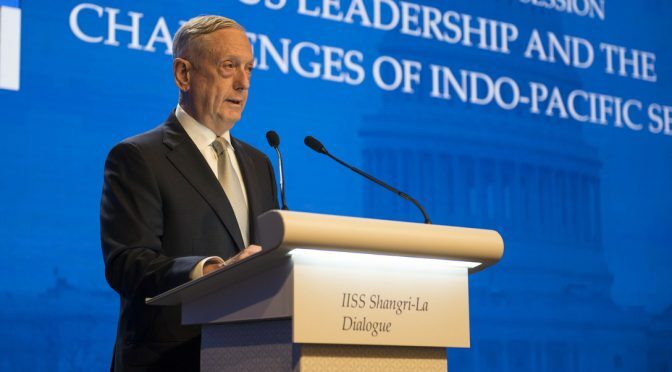 Leadership and the Challenges of Indo-Pacific Security), U.S. Secretary of Defense Mattis rebuked China for “intimidation and coercion” in the Indo-Pacific and declared that America does not plan to abandon its leading role in the region. He also specifically called out Beijing’s destabilizing militarization of the SCS, while further encouraging and challenging China to act responsibly in accordance with established global rules and norms. During the fifth plenary session (Raising the Bar for Regional Security Cooperation), the French Minister of Armed Forces Florence Parly and British Secretary of State for Defense Gavin Williamson largely echoed Secretary Mattis’ sentiments with the former making the bold statement on the SCS…“fait accompli is not a fate accepted” (referring to Chinese attempts to deny international access to the disputed waters). Both announced their intent to jointly sail their deployed naval vessels across the SCS to demonstrate their nations’ inherent right to traverse international waters and to send the “strongest of signals” on the importance of freedom of navigation. 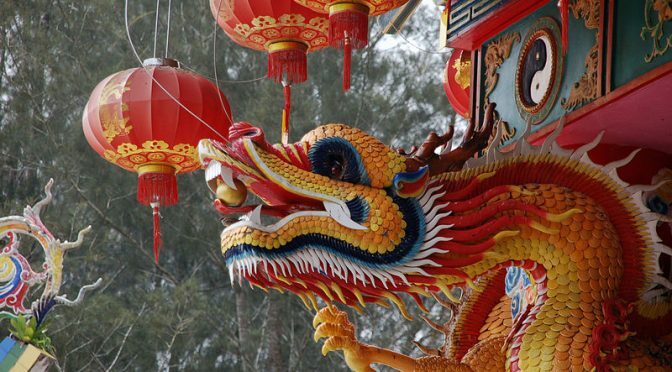 Chinese diplomatic and media responses were again expectedly swift and coordinated, but much sharper and more assertive (and perhaps even better prepared) than last year. The PLA delegation forcefully defended Beijing’s military activities in the SCS and sharply criticized Secretary Mattis’ “irresponsible remarks” on the issue and for his unhelpful “hyping” of the situation. LTG He also took advantage of the public forum to reiterate Taiwan as a Chinese “core interest” and a “red line that cannot be challenged.” This is part of its deliberate campaign to push back hard against the Taiwan Travel Act, approval of marketing licenses to sell U.S. technology to Taipei that would allow for building of advanced Taiwanese submarines, a U.S.-Taiwan agreement to share defense research, and the dispatch of formal U.S. officials to the opening ceremony of a new office building to house the American Institute in Taiwan (the defacto U.S. Embassy). During the fifth special session (Strategic Implications of Military Capability Development in Asia-Pacific), LTG He vigorously defended Beijing’s actions and activities in the SCS to include the recent deployments of weapon systems to its military outposts. He re-asserted the Chinese strategic narrative that the islands belonged to China, Beijing was only acting to defend the country’s indisputable sovereignty, and that U.S. FONOPs were the “real militarization of the SCS.” He also reiterated the point that China has not obstructed any military vessels following international laws and was open to discussions on the interpretation of FON. The rest of his speech characterized the ongoing PLA reforms and modernization efforts as benign and largely defensive in nature, praised Beijing for its constructive role in the denuclearization of the Korean peninsula, and repeated last year’s talking points on the need for a new Asia-Pacific security framework and the BRI. At the end of the day, the scope, nature, and extent of China’s present participation in the SLD can best be summed up as taking the middle road (hedging). Beijing wants to respond to any policy criticism and challenge any narrative counter to their own at the forum, but does not want to openly endorse or promote the SLD. It seems content for now to limit its role in the special session, and reserve the right to speak at the higher-visibility plenary session when warranted (only individuals of full ministerial rank can speak in plenary). That said, Beijing may one day conclude that the juice may not be worth the squeeze. Why bother with the biased and fading SLD, when it can focus instead on building up its own Xiangshan Forum? This regional forum is already widely seen in Beijing as a growing counter to the SLD and an important part of a strategic agenda to displace the extant Western-oriented world order with one without dominant U.S. influence. If so, one can expect a re-emerged, revitalized, and restructured Xiangshan Forum after an unexpected and self-induced one-year hiatus. The BRI (with its hidden nationalist agenda and subdued geo-strategic implications) ultimately needs an accompanying and complementary security framework with Chinese characteristics that the forum can help foster and promote under Beijing’s terms. The new Chinese strategic approach calls for the balanced integration of interests – both long-term economic development with concomitant security reforms intended to restructure and realign global political and security order. This will be pursued in tandem with safeguarding and enhancing the internal apparatuses of China’s socialist and authoritarian system until it can be the center of that new Beijing-oriented global order. Beijing clearly views the SLD as an adversarial international forum used by its perceived strategic rival – Washington – and its allies to unfairly criticize (and contain) China. But despite the critiques, Beijing may also see some value (but not necessarily the overwhelming need) to participate in these multilateral dialogues and perhaps begrudgingly accept the criticism of China as a natural outgrowth of its rise as a global power. Tuan Pham is widely published in national security affairs and international relations. The views expressed therein are his own and do not reflect the official policy or position of the U.S. Government. This article is published in partnership with the U.S. Naval Academy’s Foreign Affairs Conference (NAFAC). In the Western world, the freedoms of press, speech, assembly, and petition are considered vital to the functioning of a healthy democracy. Free media acts as the fourth estate by providing information to the masses, while citizens under a democratic government can expect to have their speech heard through assembly and petition. 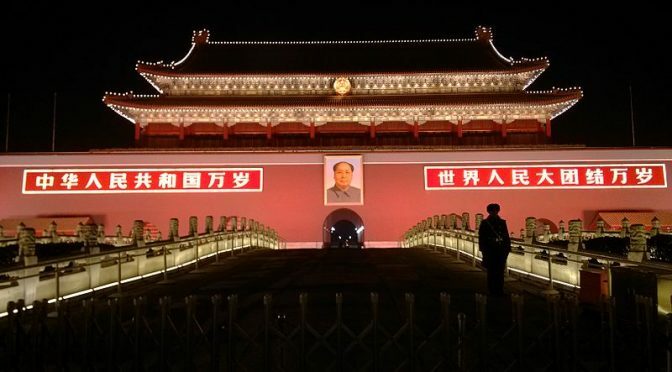 In the People’s Republic of China, the freedoms of press, speech, assembly, and petition intersect as the government uses the media – rather than brute force – to repress and silence democratic movements. Media control in China affords the government a one-two punch when countering pro-democracy protests: censorship silences social movements from the bottom, and those that succeed into physical demonstrations are oppressed and marginalized via the state media’s protest paradigm. According to Freedom House, China is home to one of the world’s most restrictive media environments.1 The Central Propaganda Department (CPD) and State Administration of Press, Publication, Radio, Film and Television (SAPPRFT) ensure media content is consistent with the goals of the Chinese Communist Party (CCP).2 In regard to pro-democratic protests, the government’s media approach consists of two prongs: repression and silence. State media coverage of protests falls under the protest paradigm, a phenomenon in which news outlets spotlight the appearance and behaviors of protesters – rather than their mission – in an attempt to marginalize them.3 The protest paradigm is a powerful tool for the Chinese media, which often portray protesters as violent and lawless, yet do not provide much content on the social movements themselves. Online, the Chinese government uses censorship to silence citizens, both leading up to and during demonstrations. Nationwide technical filtering, or “the Great Firewall,” blocks international news outlets.4 Furthermore, it blocks major social media platforms such as Twitter and Facebook, and Chinese alternatives such as Sina Weibo and WeChat are heavily monitored.5 Censorship is used to eliminate potential pro-democracy movements before they blossom into full-scale physical demonstrations; if large social uprisings do occur, the government censors terms and images associated with them. These tactics create a sophisticated strategy that enables the CCP to not only silence protesters, but systematically oppress them. Free media has a profound impact on democratic movements, perhaps more than any other social institution. A free and independent press is a catalyst to free speech, assembly and petition. Understanding this, the Chinese government has taken a comprehensive approach toward the media in an effort to suppress pro-democracy uprisings. The state media’s protest paradigm approach and the government’s online censorship tactics make an effective system in oppressing the freedoms essential to democracy. As long as state media continues to vilify political changemakers and the government maintains strict online censorship and surveillance, China will continue to succeed in countering any kind of pro-democracy movement, whether in territories such as Hong Kong or on the mainland. Yena Seo is a student at Ithaca College studying Journalism and Politics, with a concentration in International Studies. She plans to pursue a career in national security. Calamur, Krishnadev, “One System, Two Media: How China, Hong Kong are Covering the Protests,” NPR, October 1, 2014, accessed March 31, 2018, https://www.npr.org/sections/thetwo-way/2014/10/01/352747590/one-system-two-media-how-china-hong-kong-are-covering-the-protests. Chappell, Bill, “25 Years After Tiananmen Protests, Chinese Media Keep It Quiet,” NPR, June 4, 2014, accessed March 31, 2018, https://www.npr.org/sections/thetwo-way/2014/06/04/318756603/25-years-after-tiananmen-protests-chinese-media-keep-it-quiet. Freedom House, “Freedom of the Press 2017: China,” accessed March 31, 2018, https://freedomhouse.org/report/freedom-press/2017/china. Martinez-Gutierrez, Paula, “Media Coverage of Protests in China,” Brown Political Review, March 4, 2015, accessed March 31, 2018, http://www.brownpoliticalreview.org/2015/03/media-coverage-of-protests-in-china/. Newsweek Staff, “Covering the Tiananmen Square Massacre, Then and Now,” Newsweek, June 4, 2015, accessed March 31, 2018, http://www.newsweek.com/covering-tiananmen-square-massacre-then-and-now-339542. Parker, Emily, “Social Media and the Hong Kong Protests,” The New Yorker, October 1, 2014, accessed March 31, 2018, https://www.newyorker.com/tech/elements/social-media-hong-kong-protests. Ramzy, Austin, “Egypt Wave Barely Causes a Ripple in China,” TIME, February 8, 2011, accessed March 31, 2018, http://content.time.com/time/world/article/0,8599,2046901,00.html. Saif Shahin, Pei Zheng, Heloisa Aruth Sturm, and Deepa Fadnis, “Protesting the Paradigm: A Comparative Study of News Coverage of Protests in Brazil, China, and India,” The International Journal of Press/Politics 21, no. 2 (2016), 145, accessed March 31, 2018, doi: 10.1177/1940161216631114. Bill Chappell, “25 Years After Tiananmen Protests, Chinese Media Keep It Quiet,” NPR, June 4, 2014, accessed March 31, 2018, https://www.npr.org/sections/thetwo-way/2014/06/04/318756603/25-years-after-tiananmen-protests-chinese-media-keep-it-quiet. Krishnadev Calamur, “One System, Two Media: How China, Hong Kong are Covering the Protests,” NPR, October 1, 2014, accessed March 31, 2018, https://www.npr.org/sections/thetwo-way/2014/10/01/352747590/one-system-two-media-how-china-hong-kong-are-covering-the-protests. Paula Martinez Gutierrez, “Media Coverage of Protests in China,” Brown Political Review, March 4, 2015, accessed March 31, 2018, http://www.brownpoliticalreview.org/2015/03/media-coverage-of-protests-in-china/. Emily Parker, “Social Media and the Hong Kong Protests,” The New Yorker, October 1, 2014, accessed March 31, 2018, https://www.newyorker.com/tech/elements/social-media-hong-kong-protests. Austin Ramzy, “Egypt Wave Barely Causes a Ripple in China,” TIME, February 8, 2011, accessed March 31, 2018, http://content.time.com/time/world/article/0,8599,2046901,00.html.